Learn how to take knock out photos of boxing matches. The key to learning how to take boxing photos that you can be proud of is practicing the basics of sports photography. Boxing matches create challenging shooting conditions for photographers. 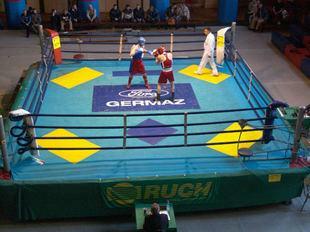 In addition to the traditionally poor lighting featured at boxing venues, the constant action and unpredictable moves made by boxers can yield blurry images and poorly composed shots. That's why it is so important to be at the top of your game when capturing action photos. By learning how to manipulate lighting and using the best photo equipment available, you have a decent shot at taking knock out boxing pictures. Before you even step foot into a boxing arena, make sure you know a thing or two about the sport. There is no way you will be able to shoot decent pictures of a fight if you don't understand the rules of the game. Conduct research on who and what you need to focus on during a boxing match. Consider talking to coaches, boxing fans or the fighters themselves before you start shooting. You might even consider studying boxing matches on TV to get a feel for how the action ebbs and flows. By previewing a few matches, you will be better able to make a determination on varying angles and focal lengths. Timing is critical in order to capture frame worthy action photos. When shooting boxing matches, you have to anticipate what is going to happen next. If you are off by even a fraction of a second, you missed the shot. If a fighter throws a winning punch and you blink, you will have missed your opportunity. As a sports photographer, you need to stay a step ahead of the action and keep your finger on your camera's shutter button at all times. In order to get a spectacular shot of a punch landing on a boxer's face, you need to start shooting when the boxer looks like he is going to throw a punch. This practice can yield a ton of unwanted shots, but it's the only way you can increase your odds of getting a winning photo. The more you know about your camera's feature and nuances, the better chance you have of landing superior shots of boxers. Experiment with your camera and lenses before the day of the big match-up. Also, familiarize yourself with which way the shutter speed dial turns to increase the exposure without having to look at it. In regards to lenses and exposure, the best range to shoot boxing matches is 24-70 or 16-35. If you don't have the means to purchase expensive lenses, then stick with 50 f/1.8. In most cases, action photos can be taken with a 28mm lens. Adjust the ASA on the camera to give you at least 1/250 of a second, or optimally, 1/500 or faster. You might also consider shooting RAW, if you have enough memory. The average gym doesn't provide adequate lighting for action photography. In most cases, exposure is around f/2.8 at 1/500-1/250 with ISO 1600. When shooting a boxing match in low light levels, you need to compensate with your own resources. If lighting is even, shoot in Manual mode, though you still need to determine the proper exposure. Crank the ISO, so you can have some depth of field. Have a cloth handy to wipe off boxers' bodily fluids from your camera lens. Constantly check your exposure if the light is changing. Choose a shooting spot that will give you an interesting background and separate the action in the foreground from the background. You don't want to frame a shot with a background that will distract from your main subject.